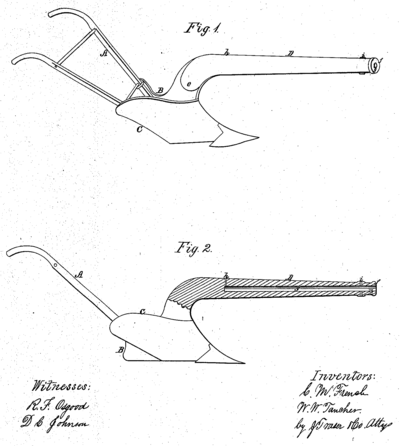 Two New Yorkers invented this and had it patented in 1862. At the time, the battles of First Bull Run and Shiloh had made pretty clear that the war wasn't going to be over anytime soon, but it may be that people in central New York were still not fully apprised of what a Civil War battlefield was like. 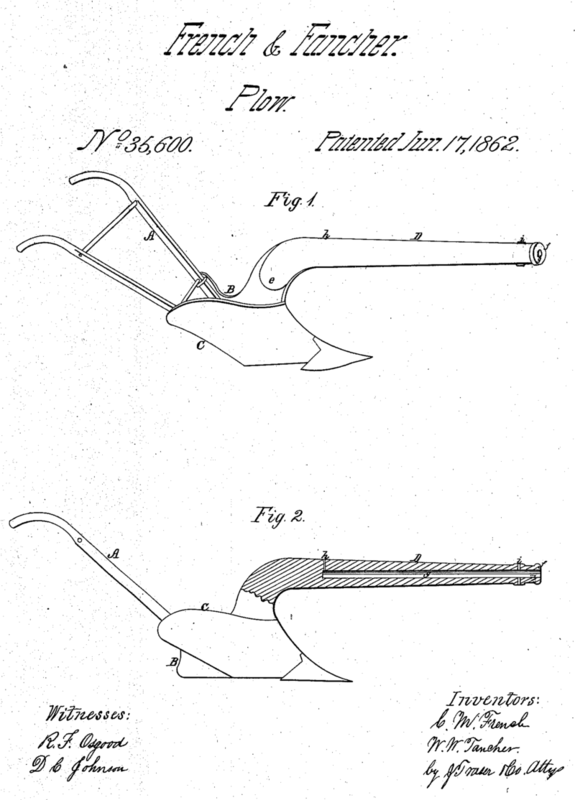 At least that's my theory as to the invention of the "Improved Ordnance Plow." The object of our invention is to produce a plow equal, if not superior, in point of strength and lightness as to that implement as ordinarily made, and at the same time to combine in its construction the elements of light ordnance, so that when the occasion offers it may do valuable service in the capacity of both implements. As a piece of light ordnance its capacity may vary from a projectile of one to three pounds weight without rendering it cumbersome as a plow. Its utility as as an implement of the twofold capacity described is unquestionable, especially when used in border localities, subject to savage feuds and guerrilla warfare. As a means of defense in repelling surprises and skirmishing attacks on those engaged in a peaceful avocation it is unrivaled…. The [plow]share serves to anchor it firmly in the ground and to resist the recoil, while the handlevers … furnish convenient means of giving it the proper direction. In fact it seems almost certain to me that this would not have been very good at doing either of the things it was supposed to do. While the extra weight of the cannon would probably help push the plowshare down into the soil, it would also have made it much harder for the team to pull, I assume. Meanwhile, having the cannon mounted on a plow rather than a wheeled carriage would have made it impossible to aim, handlevers or no. And for the plowshare to be any good at resisting recoil, it seems like it would have to point the other way. So based on my amateur evaluation, I would say the only thing this would have been good at is getting its owner killed. Either the Rebels, who might otherwise have just ridden by after seeing you were a non-combatant, would be encouraged to kill you after you missed with your one shot from the plow cannon, or they wouldn't have to because the recoil would do it for them. Getting its owner killed and amusing the enemy, so that's two things it would have been good at, I guess.